We are going to select visiting professors for Summer School ULHT Lisbon 2017. For the full call, please keep reading. Seashores, riverfront, ocean coastlines, ports face the challenges of the climate changes and is impact in this delicate and complex urban territory. Portugal, as a sea-country, it will be the best place to inspire the creativity and the talent of the architecture students. 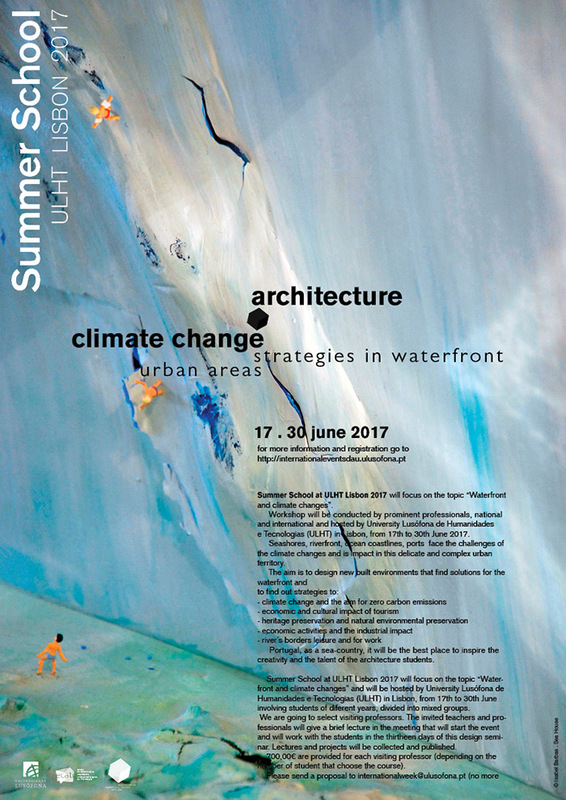 Summer School at ULHT Lisbon 2017 will focus on the topic “Waterfront and climate changes” and will be hosted by University Lusófona de Humanidades e Tecnologias (ULHT) in Lisbon, from 17th to 30th June involving students of diferent years, divided into mixed groups. We are going to select visiting professors. The invited teachers and professionals will give a brief lecture in the meeting that will start the event and will work with the students in the thirtheen days of this design seminar. Lectures and projects will be collected and published. 700,00€ are provided for each visiting professor (depending on the number of student that choose the course). Please send a proposal to internationalweek@ulusofona.pt (no more than one A4 page, pdf format).